Dachau Concentration Camp memorial site reminds visitors of the crimes perpetrated by the Third Reich. The Nazi regime in Germany has become synonymous with inhuman cruelty. Hitler incarcerated millions in his concentration camps and inflicted on his victims the harshest forms of torture and deprivation imaginable. Millions never made it out of these camps alive. The first major Nazi concentration camp was located near Dachau, Germany—12 miles northwest of Munich. Today the Dachau Concentration Camp Memorial Site, a museum that opened in 1965, is dedicated to ensuring that Nazi crimes will never be forgotten. Anyone interested in contemplating the meaning of World War II should visit this place. After assuming the German chancellorship in January 1933, Hitler wasted no time in rounding up his enemies. The camp at Dachau opened on the grounds of an old munitions plant barely two months after Hitler took power. It was administered by his personal security force, the dreaded Schutzstaffel (SS). It initially contained domestic political opponents, but as the Nazis extended their brutal reach across Europe, numerous other groups arrived. Dachau filled beyond capacity, and satellite camps opened across Bavaria to absorb the overflow. 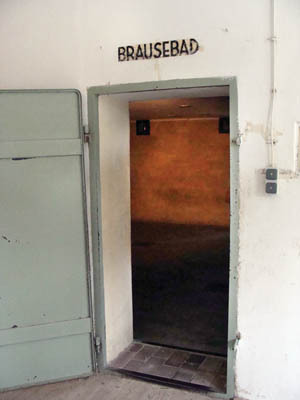 Entry to the Brausebad (shower room) that was in reality a gas chamber. It is believed that no gassings were carried out here, and this was only a training facility for SS personnel. Dachau was not built to be an extermination camp like Auschwitz in Poland, but thousands perished there nevertheless—beaten and tortured to death, “shot while trying to escape,” or killed by starvation and disease, and by sadistic medical experiments. The camp also served as a training site for SS concentration camp guards—the men who would later serve as executioners at places like Auschwitz. 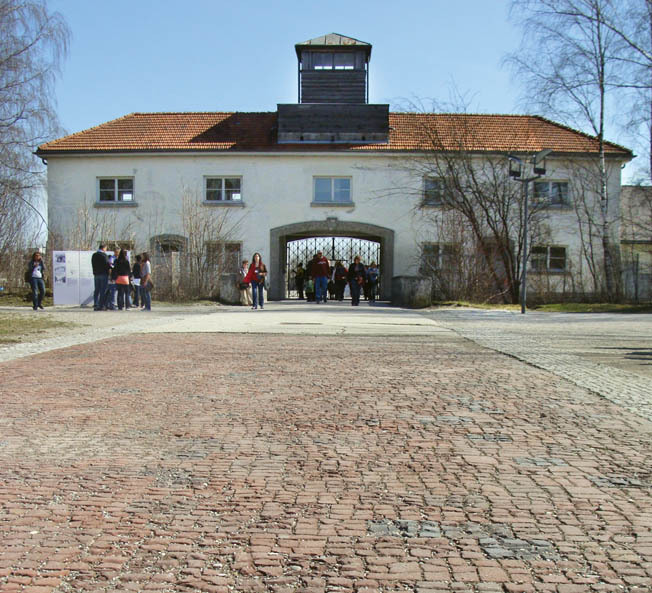 A visit to Dachau is not for the faint of heart. As prisoners arrived, they were greeted by the words Arbeit Macht Frei (“Work will set you free”), welded to the camp’s iron gate. But work was not rewarded, and few were ever freed. This wrought-iron lie was standard at Nazi concentration camps. The former administration building is now a museum. Exhibits tell of daily life in the camp and acknowledge the diverse array of people Hitler incarcerated there, including communists, socialists, union activists, Jehovah’s Witnesses, dissident clergy, resistance fighters, Soviet prisoners of war, homosexuals, and Roma and Sinti peoples (better known as Gypsies). Jews had been present since the camp opened but arrived in large numbers after the anti-Jewish pogroms of 1938. Viewing these exhibits, the depth of Nazi hatred and paranoia becomes clear. The museum also describes the various forms of torture the prisoners endured. In one, while hanging from steel beams with their arms tied behind their backs and suspended from the ceiling by their wrists, the victims were subjected to beatings and verbal abuse. One can almost hear the screams reverberating through the room. 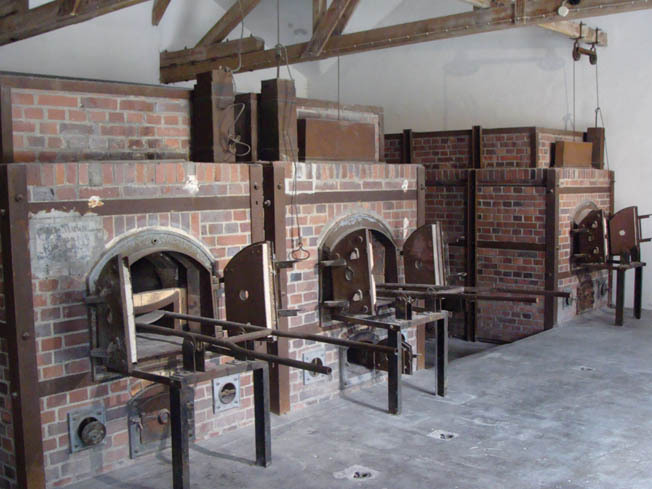 The grim ovens within the crematorium where thousands of inmates who died at Dachau during its 12 years of existence were disposed of. A long rectangular building stands in a wooded area not far from the barracks. It contains the most disturbing sights of the entire camp. Inside is a room labeled Brausebad (shower). In reality, it was a gas chamber, but there is no evidence that prisoners were ever gassed there. It was likely used for training purposes only. The main gate to the prisoner enclosure at the Dachau Concentration Camp Memorial Site. However, the crematorium also found in this building was used with great frequency to dispose of the many prisoners who died. Brick ovens stand with their steel doors open, as if to receive their next victim. The ashes from the crematorium were unceremoniously dumped along a cement wall behind the building. Prisoners were also lined up against this wall and shot. Trees, a tangle of underbrush, and even the occasional flower now grow where untold numbers of people were once executed—life thriving in a place where death once reigned. Dachau is not just a reminder of past horrors, but also a place of healing. Religious memorials are clustered near the crematorium, providing a welcome sanctuary from the harsh realities of the camp. Roman Catholic nuns of the Carmelite Order even maintain a convent on the grounds. Footprints of the barracks (left), a partially filled in moat, sinister guard tower, and barbed-wire fence silently remind visitors of the cheapness of life at Dachau. American troops arrived at Dachau on April 29, 1945, and ended the horror and bloodshed. The GIs who liberated the camp were shocked and outraged at what they saw but were also reminded of the reasons why the war had to be fought. Visitors to Dachau today come away with a better understanding and appreciation of those reasons as well. Tags Adolf Hitler, Axis, Concentration Camps, Dachau, Nazi Germany, Schutzstaffel (SS).